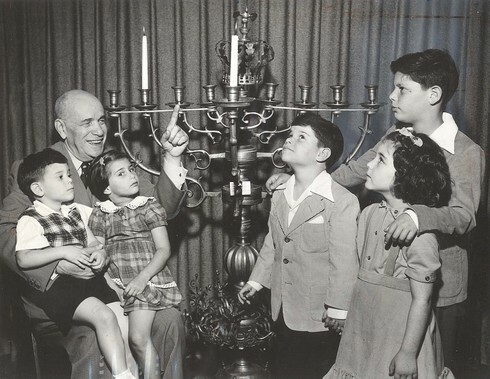 Children love a hero and every year in Kislev – usually falling in December - Jewish children and their families recount joyously the story of Hanukkah and commemorate its hero, Judah Maccabee. In the 2nd century BCE, the Greco-Syrians captured and defamed the holy Temple and forced Jews to denounce their beliefs. As happened many times in Jewish history, the future of Judaism was at risk. In166 BCE, Judah Maccabee, a priest with strong faith, led a revolt against the powerful Greco-Syrian empire. Against improbable odds, a miracle occurred; his brothers and he led a small army and defeated the Greek governor of Samaria, paving the way for further victories against even larger Greek armies. In December 164 BCE, the Maccabees regained control of Mount Zion. They cleansed the Temple and rid it of Hellenistic altars, reconstructed it according to the laws of the Torah, and rededicated it for Jewish worship. More than two millennia later, Judah Maccabee would be proud that Judaism has survived and thrived. In many generations, others attempted to annihilate us, but also in those generation, heroes emerged. In the face of persecution, oppression, mortal danger, these Jewish heroes preserved our heritage and ensured that the chain remained unbroken. We have times when we remember the dead and, of course, many of our heroes are remembered in our prayers. I believe that it is also important to take time to remember the lives of our heroes, share with our children their stories and derive inspiration from the lessons that their examples serve. For Hanukkah 2006, I recommended the best eight gifts for Hanukkah and ended with the gift of Judaism. In the hopes of further honoring this gift, I suggest that this Hanukkah and every Hanukkah from here on, we engage in a new tradition and share with our children our strong heritage of Jewish heroism. In addition to remembering Judah Maccabee and the Greco-Syrian revolt, remember the other heroes of our Jewish history. Each night, as we light the Hanukkah candles read a story of a Jewish hero, someone who risked his or her life to preserve our heritage so that today we can continue to live our lives proudly as Jews. Over the past few weeks, I recalled the stories I heard as a child, thought about more recent heroes who touched my life, sought counsel from friends, and searched the web. I was overwhelmed with the large number of Jewish heroes in our past, but I limited myself to eight heroes for the eight nights of Hanukkah, 2008. I wanted to include a good variety among the eight – those who demonstrated military prowess and others who demonstrated strength of character; young and old, historical and contemporary, famous and ordinary. My choices, in the end, were arbitrary and therefore no specific importance should be given to them. Rather, each had an interesting story to tell and shared the common characteristic of preserving the unbroken chain of our heritage. I hope that you enjoy recounting the stories of my heroes. I encourage you to read these or other stories of Jewish heroes with your children, one per night at Hanukkah. You can go further by enriching this new tradition in our community by sharing your Jewish hero stories with the readers of the Philadelphia Jewish Voice and with me. In future years, we can choose from your stories to highlight an additional eight heroes to honor during the nights of Hanukkah. Adapted from The Revolt of the Maccabees by Rabbi Ken Spiro. The year is 167 BCE and the horrible persecution of Judaism by the Greeks is in full swing. The Greek troops show up in the town of Modi'in (a site west of Jerusalem which you can visit today off the Jerusalem-Tel Aviv highway) and demand that the Jews there sacrifice a pig to the Greek gods. The elder of the town, Mattathias, who is a cohen, that is of the priestly class, refuses. Those who join Mattathias and his five sons - named Judah, Elazar, Yohanan, Yonaton and Shimon - head for the hills, expecting that the Greeks are going to come back and wipe out the whole village as a reprisal. In the hills, they organize a guerilla army, led primarily by the oldest of the sons named Judah, nicknamed Maccabee, which means "the Hammer." Maccabee is also an acronym for mi kamocha ba'aylim Adoshem, "who is like you among the powers O God," - the battle cry of the Jewish people. We don't know exactly how large this Maccabee army was, but even the most optimistic estimates put the number at no more than 12,000 men. This tiny force takes on the fighting Greek army of up to 40,000 men. It's not just a numerical superiority the Greeks have. The Greeks are professional soldiers - they have equipment, they have training, and they have a herd of war elephants, which were the tanks of the ancient world. The Jews are vastly outnumbered, poorly trained, and poorly equipped (not to mention, they have no elephants), but what they lack in training and equipment they make up in spirit. Most of the battles take place in the foothills leading from the coastal plain area (Tel Aviv) to Jerusalem. The Greeks are trying to march their armies up the natural canyons that lead into the mountain areas, the stronghold of the Jewish army. There are only a few places where the Greeks can ascend and this is where the Maccabees choose to take them on. Now when we read the story of the Maccabees it seems like it's something that takes place over a few weeks - the battles take place, the Jews win, and the Greeks go home. But, in fact, it takes 25 years of fighting and a great many casualties on both sides. After the first three years, the Jews are able to re-conquer Jerusalem. They find the Temple defiled and turned into a pagan sanctuary, where pigs are sacrificed on the altar. When they re-enter the Temple, the first thing they do is try to light a make-shift menorah (as the gold one had been melted down by the Greeks) but only one vial of pure lamp oil with the special seal is discovered. They use this vial to light the menorah and miraculously it stays lit for eight days, by which time fresh pure oil has been pressed and delivered to the Temple. The rededication of the Temple does not end the fight, however. 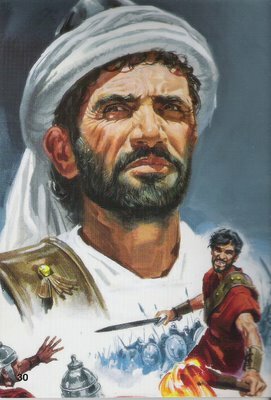 Unfortunately, some of the Hellenized Jews are not happy that the Maccabees took over Jerusalem; they join forces with the Greeks and the fight continues. It's not until 142 BCE, during the reign of the Seleucid monarch Demitrius, that the Greeks finally have enough of the fighting and sign a peace treaty with Simon, the last survivor of the five sons of Mattathias. Thus, Jewish sovereignty over the Land of Israel is officially restored. I pray that these things never end. The prayer of a human beng. "Eli, Eli," a poem written by Hannah Szenes, has become a folk song and a modern prayer made famous, in part, because of her courage and dignity in the face of death. Hannah Szenes (pronounced "Senesh") was born in Budapest in 1921. Her father, a well-known writer, died when she was six. Hannah and her brother, George, were raised in a middle-class, assimilated home by their mother, Catherine. Although Judaism was not emphasized in her home life, Hannah's diary entries show that she was very concerned about the rising anti-semitism in Europe. Hannah was a brilliant student, at the top of her high school class. But because of discrimination against the Jews in Hungary, she would have to convert to Christianity in order to continue her education at the university. Instead, both Hannah and her brother became Zionists and immigrated to Israel. Hannah enrolled in an agricultural school and joined kibbutz Sdot Yam two years later. She began to demonstrate literary talent by writing poetry and plays in Hebrew. Hannah Szenes was 23 years old. 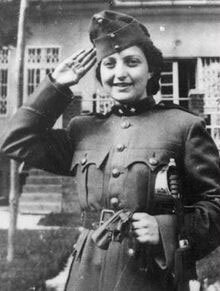 In 1950, Hannah Szenes' remains were re-buried on Mount Herzl in Jerusalem. Her diary and many of her literary works have been published, some set to music, including the poem she wrote shortly before her death, "Blessed is the Match." To view previous editions of "Raising a Mensch", please click here.